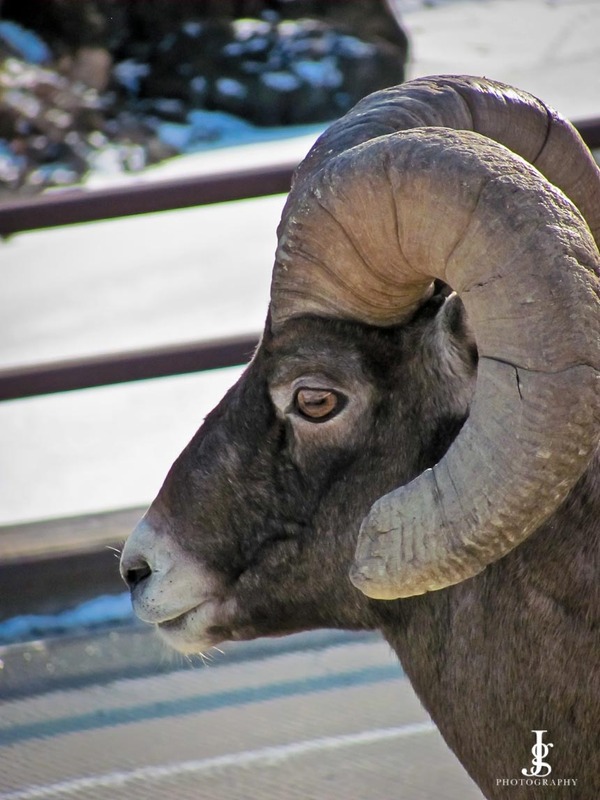 As you know I am originally from Cody Wyoming and have grown up outdoors and with animals. Being on a farm I previously worked every day with cows, chickens, pigs, dogs, cats … and more cows. Something you may not realize I live less than 60 miles from Yellowstone National Park. To get there from my house we would drive up a windy canyon road called North Fork. It had mountains on either side of the road and a rolling river full of freshly melted snow. It was on drives like this that we would encounter other animals. We would see buffalo, elk, deer, coyote, and Big Horn Sheep. For me this was a common occurrence but for my Wife and in-laws it was something out of their world. They are all from Birmingham Alabama which is where we currently live. How I ended up in Birmingham Alabama is another story. In this story we had all flown in to Cody that week and my Dad wanted to show them around our part of the world. This was perfect for them seeing as they love to experience anything new. We drove them around the farm, answered questions, gave lessons on how to bring in a harvest, explained how our farm worked, and generally enjoyed giving a tour. 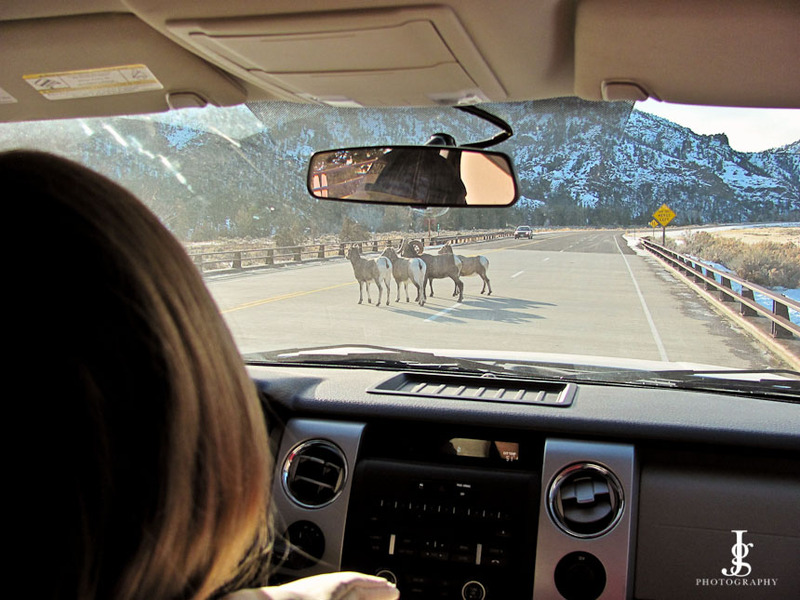 We then all loaded up into my Dads truck and drove up North Fork so they could see the Big Horn Sheep. Seeing as it was January the animals come down from the high elevations to escape the snow and find food at a lower elevation. Cody sits at about 5000 feet above sea level. We were not disappointed because right where we normally find our Big Horn Sheep every year was a flock of 40. 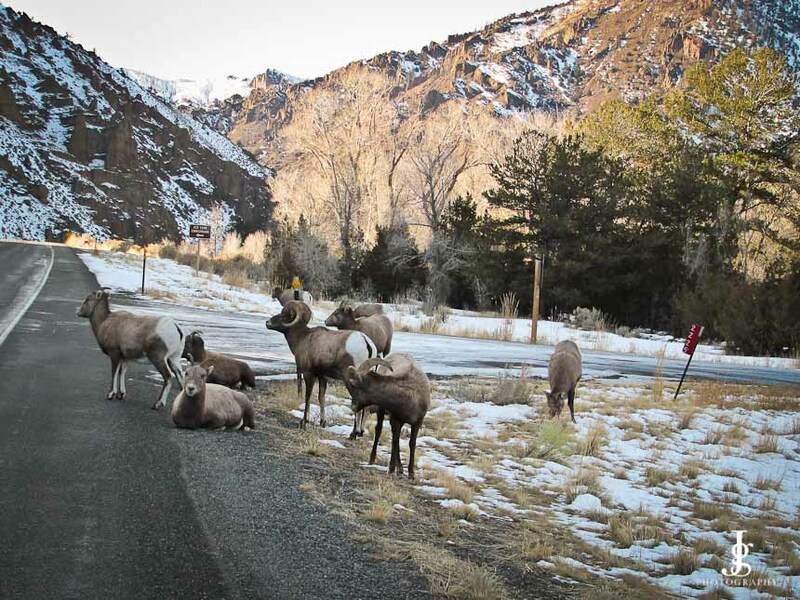 The animals sit right on the side of the road and generally don’t mind the cars passing. When they are on the road they own it. You just wait for them to cross then go around. Our trip was successful and we were able to take a few pictures of that adventure. Another wonderful thing about Wyoming is it has some of the most beautiful sunsets. Enjoy! I’m having fun looking at all your pictures. The head shot of the sheep is awesome! You could sell that picture! Very cool!